U.S. Sen. Susan Collins, R-Maine, chairs the Senate Special Committee on Aging on Capitol Hill in Washington, Oct. 2, 2018. Republican Sen. Susan Collins of Maine said she supports a lawsuit aimed at stopping President Donald Trump’s emergency declaration to build a wall on the southern border. She also said she’d vote for a disapproval resolution in Congress. 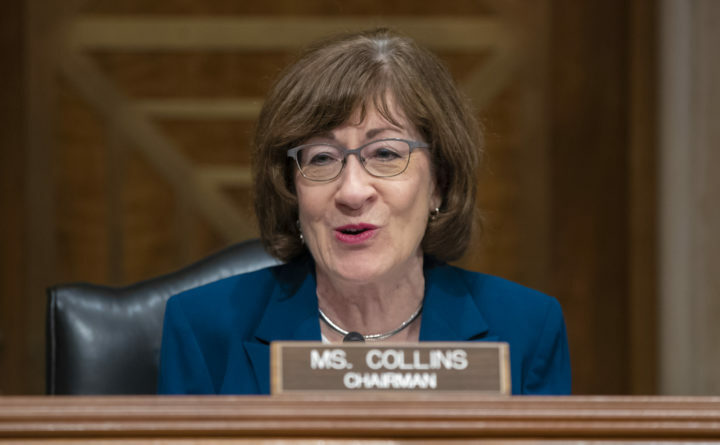 Collins said Wednesday the president’s action “completely undermines” the role of Congress and is of “dubious constitutionality.” She said the lawsuit, which Maine has joined, is the quickest way to get an injunction to halt the transfer of funds. Collins spoke in South Portland, where high-ranking U.S. Coast Guard officials celebrated an upgraded command center for northern New England. The ribbon-cutting was attended by Vice Adm. Scott Buschman, Atlantic commander based in Virginia; Rear Adm. Andrew Tiongson, district commander in Boston, and Capt. Brian LeFebvre, commander in the northern New England sector.